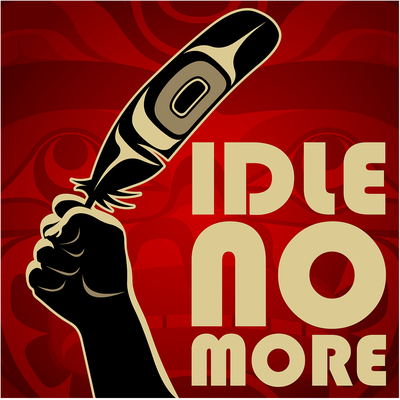 By Jacob DevaneyWhat started as a murmur in early October from First Nations People in Canada in response to Bill C45 has become a movement that echoes the sentiments of people all over the world, a battle cry of love for the planet, "Idle No More." At first glance it might appear that this movement is isolated and doesn't effect you if you are not native or if you don't live in Canada, yet it does. It may appear that this resistance is not related to The Occupy Movement, The Arab Spring, The Unify Movement, Anonymous, or any of the other popular uprisings sparked by social unrest, but it is. At its very core, all of these movements have very common threads and are born from common issues facing people everywhere. Those who represent financial interests that value money over life itself, that are devoid of basic respect for human decency, and for nature have dictated the future for too long and people everywhere are standing up to say, "No more." This non-violent social uprising is viral in the minds and hearts of everyone across the planet determined to bring healing to our troubled communities, our planet, and the corruption that is eroding the highest places of governments around the world.And:With Twitter, Facebook and the internet, these separate movements are finding solidarity with each other and converging as a global super-movement for the planet and all people. The quote used at Unify is, "Everyone, Everywhere, Together" and it is beginning to resonate more than ever. Each of these movements share a commitment to non-violent revolution in their call to end the exploitation of people and the exploitation of natural resources. Sustainability can be applied to all aspects of social rights, economics and the environment. Social, economic, cultural, and environmental movements, resistance, civil disobedience, flash mobs and more will continue until this is addressed at home and abroad. Whether it is Anonymous and Wikileaks exposing the corruption of governments, or Indians with drums dancing and chanting in a local mall, people everywhere are awakening, speaking up, and acting for the needed changes. It's time for politicians and religious leaders to get the message everywhere.Comment: For more on Idle No More, see Idle No More's Goals and Palestinians Endorse Idle No More.